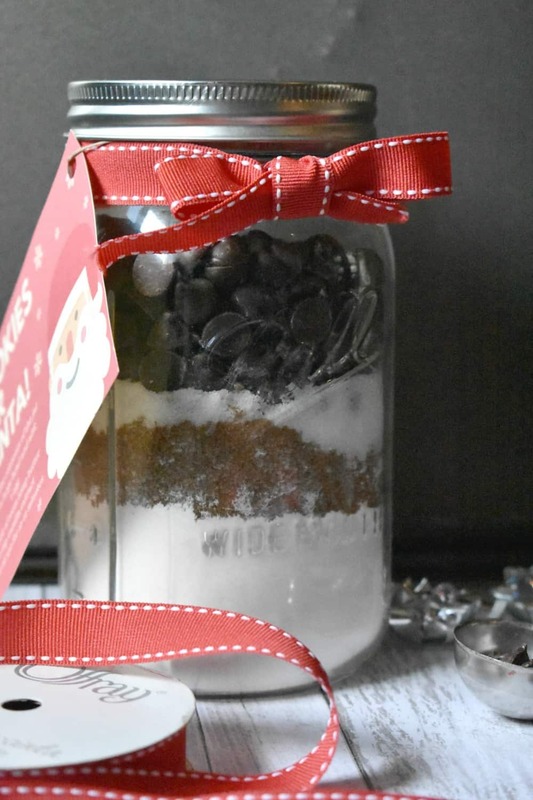 I just love giving homemade gifts during the holidays, and this Mason Jar Cookies for Santa gift is absolutely adorable. One of my favorite holiday traditions with my own kids was leaving cookies out for Santa. Even when my kids got older and no longer believed that Santa was going to stop by, we still always made Christmas cookies and left some out for “Santa” along with some carrot sticks for his reindeer. “Santa” was my hubby and he LOVED eating all of the cookies and just leaving behind a few crumbs on the special plate, just for the fun of it. 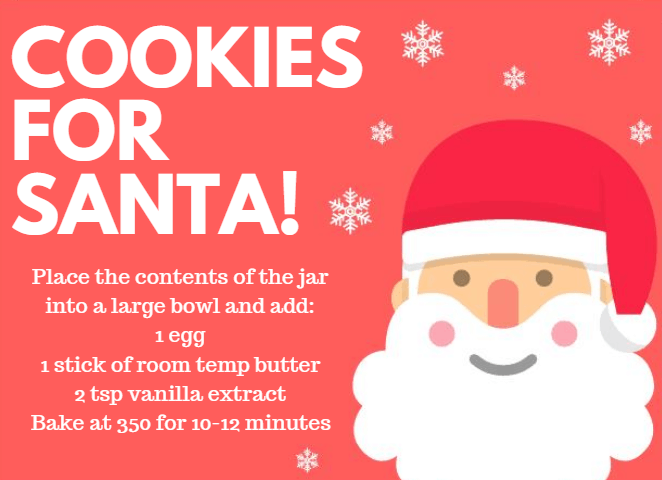 I am planning to make this Mason Jar Cookies for Santa gift to give to my daughter and grandson so that they can enjoy this special holiday tradition just like we did all those years. I might even make up some Magic Reindeer Food to go along with it too! 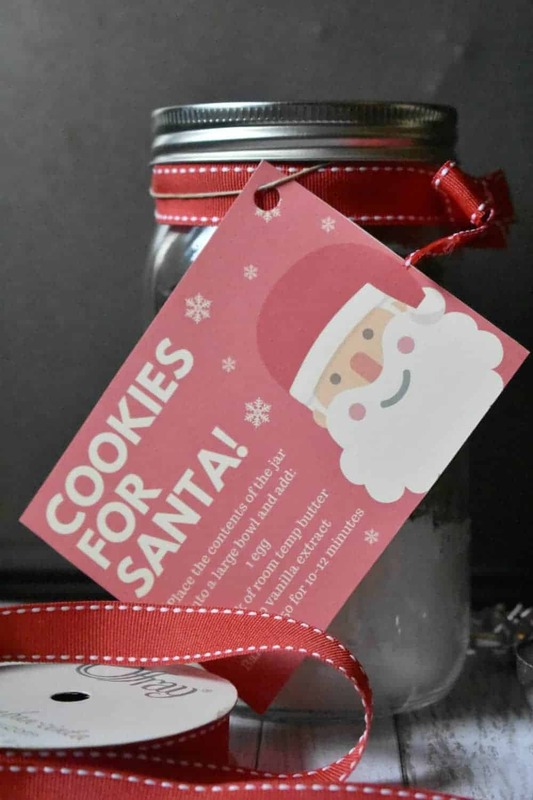 You’ll also need a large mason jar, some decorative ribbon to make it pretty and this Printable Cookies for Santa Gift Tag which also has the baking instructions on it. Combine flour, salt, cornstarch, and baking soda together and place in the bottom of a large mason jar . Use a small cup to pack the flour mixture down into the jar. Place the brown sugar as the next layer in the mason jar. Add the granulated sugar on top of the brown sugar. Remember to pack down each layer. Last, add the chocolate chips on top of the sugar, and place the lid on the jar. Print the Santa label and decorate with ribbon!